one car costs than another over its life. Upside: it’s free. Downsides: none that I can think of. 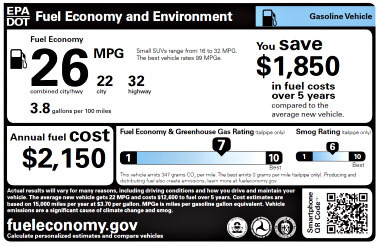 Federal regulators unveiled new fuel economy labels that could make it easier for new-car buyers to compare fuel-efficient vehicles and gas-guzzlers. In addition to the miles per gallon, the labels will show […] the expected cost of fuel over the next five years compared with the average new vehicle. Clearly the federal government stole this idea from me and now refuses to give me credit. Bastards. Oh wait. They actually did this back in 2006. But that label redesign only showed the expected cost of fuel over one year. Clearly the idea to extend this to five years was mine. I think they should name the new sticker after me.